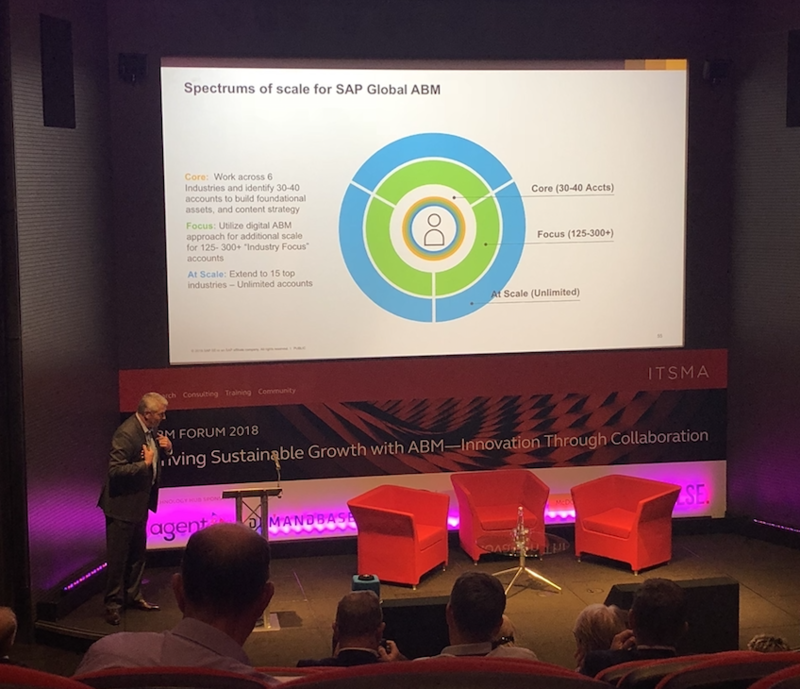 I have been to A LOT of conferences over the past two years and none of them have come close to the ITSMA ABM Forum: Driving Sustainable Growth with ABM. Not only was it great to have 3 female speakers leading the discussion with 2 gentlemen playing second fiddle, something which is not always the case, but the content was genuinely stimulating and relevant to B2B engagements in 2018. Our range of speakers went through what ABM is, how it works and some novel techniques to apply. Here are my learnings, they apply across the sales and marketing spectrum - so even if you aren't looking to implement ABM, there should be a few nuggets of wisdom that are worthwhile. You need a universal scorecard to evaluate who should be on your ABM programme and the strategy to select the right team. The scorecard methodology makes sure that you are picking targets that are going to drive long-term value and possibly more importantly who you are going to deliver long-term value to. Danny Nail of SAP talked about "nailing it" with your core Accounts before looking to cast a wider net and use these marquee accounts as an easier route in. This was a view echoed by Rhiannon Blackwell (UK&I Client Marketing Lead, Accenture) who spoke of winning a market leader in each target industry. "A lot of marketing plans are a list of actions and tactics focused on a key account but devoid of relevance to the overall business strategy + the strategy and goals of the customer." 4. Gain buy not just from budget holders but from all those you'll need to draw on to succeed. You need C-Level & stakeholder buy-in from marketing, sales, delivery and across the board. Everyone needs to realise what's in it for them if they make their counterpart look like a real superstar! With 45% of people surveyed by ITSMA saying that ABM brings in more than x2 the revenue of other (non-ABM'd) accounts, it's becoming easier to get universal buy-in. The goal cannot be to increase our profits. It has to be focused on the customer and helping them get better, achieve their goals and deliver better service to their customers. For example, here at Passle: We want to revolutionise how the world's biggest firms interact with their most important clients. We know that when we achieve that, our customers' most important and valuable staff to be able to communicate with their key clients in an authentic, dynamic, engaging way. In what was possibly one of the more refreshing parts of the day, we discussed how ABM should be judged (ultimately) in revenue. "My favourite measurement of ABM is closing more business"(Stephanie Deane, O2). There are other useful indicators of success like audience growth, changing client perceptions, engagement with the client at all levels, increased collaboration and delivering better overall value to the customer. See Rhiannon's slides below. It's impossible to deliver results without everyone working together. This starts with building the right internal team but needs to extend to clients to really understand what success looks like for them. Make them feel like a part of the process. Workshops were very popular among the audience. A nice distinction was brought up between marketing to an account and marketing for an account. The former tends to be unilateral and involves you doing what you think is right whereas the latter is a client-centric approach. It's much more resource intensive and deliberate, but will deliver long-term results for both you and your customer, because you will understand what makes them tick. Don't just build a vision by yourself. Share it with your partners and build a picture as to how you will take them on a journey. Andrea Clatworthy (Fujitsu) spoke about creating a process which enables you to share the 'watercooler' knowledge. The intangible stuff which doesn't fit into a CRM but which makes all the difference is the glue to your ABM strategy and enables a truly tailored approach. In small organisations like ours, this happens organically by chatting through the details on a daily basis. For bigger firms, making time once a week for a coffee might be the key. Whilst it seems self-evident, your plan needs to be as flexible as you! Don't presume that it will all be ok after you hit go! Your beautiful plan won't just come together without a problem and that's ok! Your strategy will inevitably change and adapt as your relationship grows with the client. Here at Passle, we have a 30-minute catch-up on our key accounts at least twice per week over a coffee. We then supplement this formal (re)planning sessions and appraisal from our senior management so we are all up to speed on what's what and can take the next best step. Danny Nail (SVP, SAP) posited that what works for one of your core accounts will almost certainly resonate with your others within that industry. Creating a process where you can feedback this information to the internal team who can use that intelligence for their next deployment is the most important part. The overall message from the excellent keynotes, as well as during the roundtables hosted by Tom (our co-founder) and I, was that what so many people struggle with engaging their key accounts and targeting buyers in a really meaningful, and personalised way because they overcomplicate things and don't do the basics well. Communicate 1-2-1, not system to person. Perhaps the best point of the day was made by Stephanie Deane who said that you are not expected to be experts in Account-Based Marketing from Day 1. Create a process which is repeatable, scalable and which puts the customer at the centre of everything you do. Most importantly, ABM is not a silver bullet nor something which will work every time but when it does, it will enable you to work closely with your clients and consistently deliver better value at scale.